The upcoming energy crisis and increasing power requirements of electronic devices have drawn attention to the field of energy storage. In a paper to be published in the forthcoming issue in NANO, researchers from the China University of Petroleum (East China) have summarized the recent advances in application of 2D nanomaterials on the electrode materials of lithium-ion batteries, owing to their compelling electrochemical and mechanical properties that make them good candidates as electrodes in lit-ion batteries for high capacity and long cycle life. Have you noticed that environmental pollution is becoming more and more serious? Have you noticed that the conflict between energy crisis and increasing power requirements of electronic device is becoming more and more sharp? So how do we tackle them? As is known to all, the use of high-performance energy storage devices, like lithium-ion batteries, is one of the effective ways. In order to obtain high capacity and long cycle life, many efforts have been made to improve the electrochemical performance of electrode materials. Owing to compelling electrochemical and mechanical properties, two-dimensional nanomaterials have been propelled to the forefront in investigations of electrode materials in recent years. Two-dimensional nanomaterials have sheet-like structures for which the lateral size is larger than 100 nm, but the thickness is only single or few-atoms. The unique structure endows its remarkable properties, such as high specific surface area, short diffusion distances, superior electrical conductivity and electrochemical and thermal stability. According to the composition, 2D nanomaterials can be divided into five categories including element, nonmetallic compound, metallic compound, salt and organic. 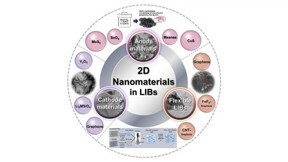 Two-dimensional nanomaterials are exceedingly desirable in various parts of lithium-ion batteries (anodes and cathodes). As anodes, 2D nanomaterials provide high theoretical capacity. The famous candidates are graphene and graphene-based composite materials, including carbon nanotubes/graphene, nonmetal/graphene, transition metal oxides/graphene, sulfide/graphene and salts/graphene. Besides, there are other kinds of 2D nanomaterials which have advantages and disadvantages. For example, MoS2 shows excellent capacity and less cycling stability and rate capacity. SnO2 has low cost and toxicity and easy accessibility, but the real capacity is lower than the theoretical capacity. MXene reveals good electrical conductivity, low diffusion barrier, low open circuit voltage and high lithium capacity, but the fabrication should be further explored to improve the surface functional groups. As cathodes, 2D nanomaterials have remarkable electron transport velocity, high theoretical capacity and excellent structure stability. It is subdivided into four categories: 1) graphene related materials (graphene modified LiFePO4, LiCoO2, LiMn2O4, etc), which improve cycling performance of traditional cathode materials; 2) V2O5, which has higher theoretical capacity; 3) Li2MSiO4, which offers good thermal stability; 4) others (covalent organic frameworks), which exhibits excellent rechargeability. Concerning the layered structure, 2D nanomaterials is easily assembled into flexible lithium-ion batteries, especially graphene and graphene-based composite materials. It conforms with the development of portable electronic products. At last, the specific anode and cathode materials and their corresponding effect are summarized. There is thereby an urgent need but it is still a significant challenge to improve production rate and control the precise structure of 2D nanomaterials. This review helps us to reveal the recent research progress of 2D nanomaterials in lithium-ion batteries, realize the challenge and predict the future researches. The team is currently exploring the syntheses and assembly of nanomaterials and the application of nanomaterials in energy storage and environmental engineering. Additional co-authors of the paper are Teng Wang, Zhiyuan Han and Lingtong Li from China University of Petroleum (East China) and Xin Wu from Colorado School of Mines. This work was funded by the Fundamental Research Funds for the Central Universities (# 18CX02158A).